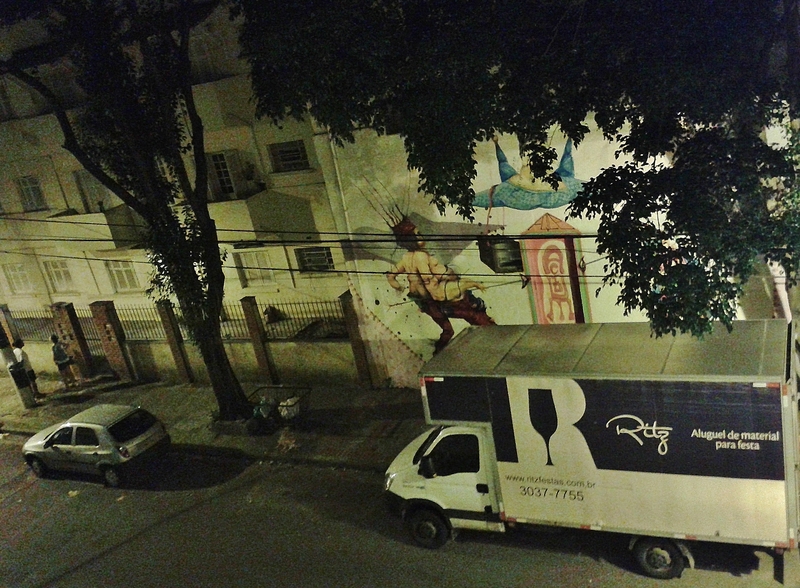 Staying in Sao Paulo while everyone is away on holiday has its advantages – quieter, cleaner air, easier access. Even losing electricity has an up side. Often happens here in Zona Oeste – with January rain, with wind, or for no reason. Takes out light in homes, and whole blocks of street lighting, makes you get out more, unhooked from the virtual. I went out for a stroll. Diesel generators power the public parts of apartment towers, LEDs light stairwells. You notice how bright the remaining street lights and traffic lights are. 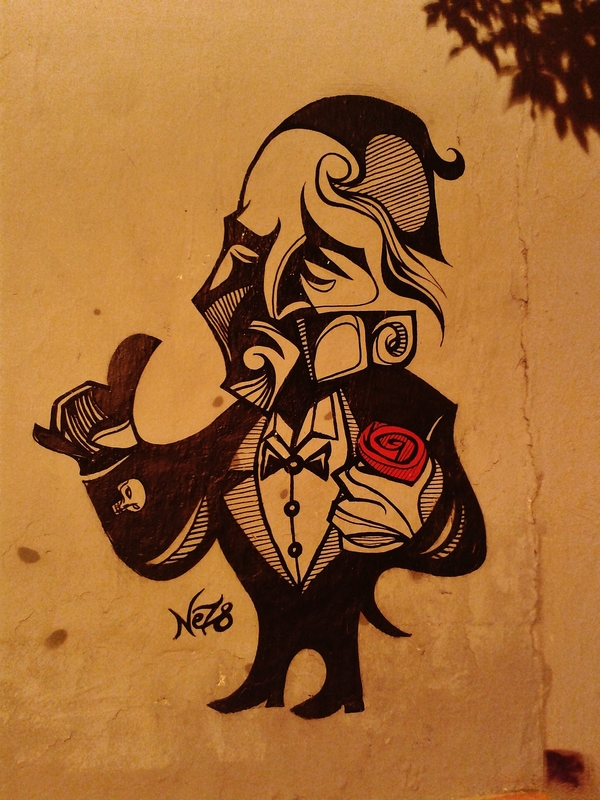 Street art takes on a new character. The mirror tiles on a mural glitter. 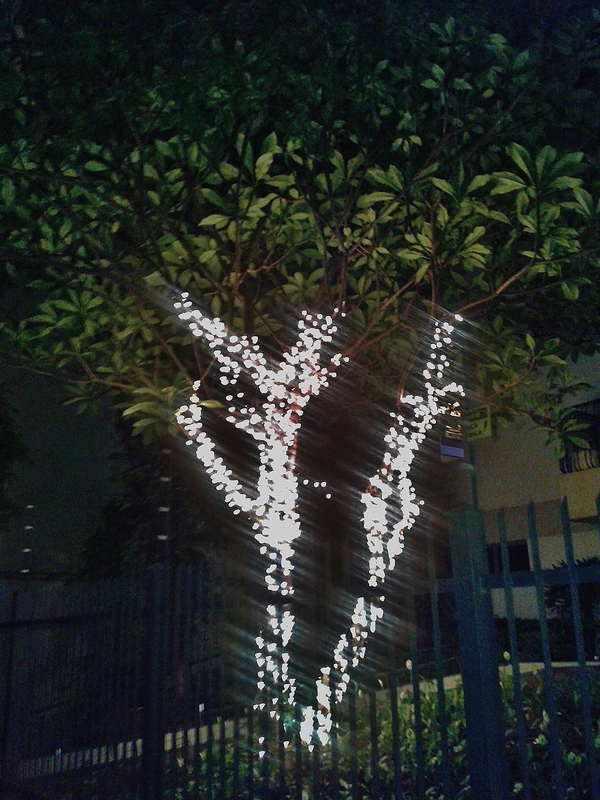 In the holiday season, decorations are up and in the dark, a little more dramatic. 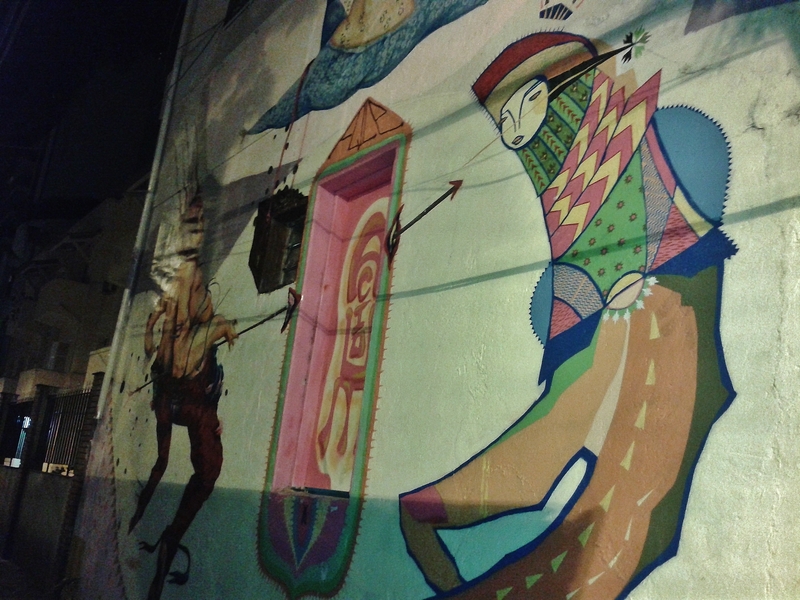 Sao Paulo is an illustrated environment. With lighting changes, you see it anew. 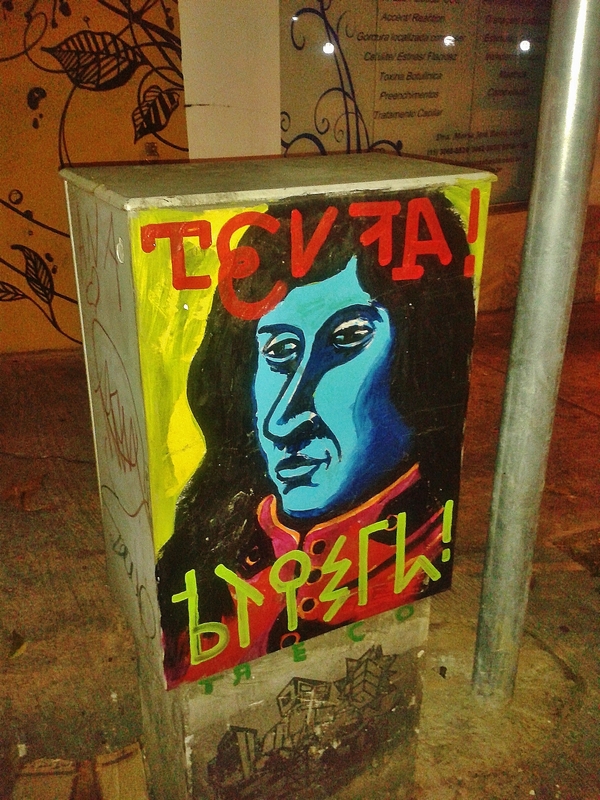 The works on these two traffic control boxes are by prolific local artist Treco, along with anti-meat stickers, declarations of love, and a sketch of an urban Transformer-style creature (on the plinth below). Here’s his Flickr photo-stream. 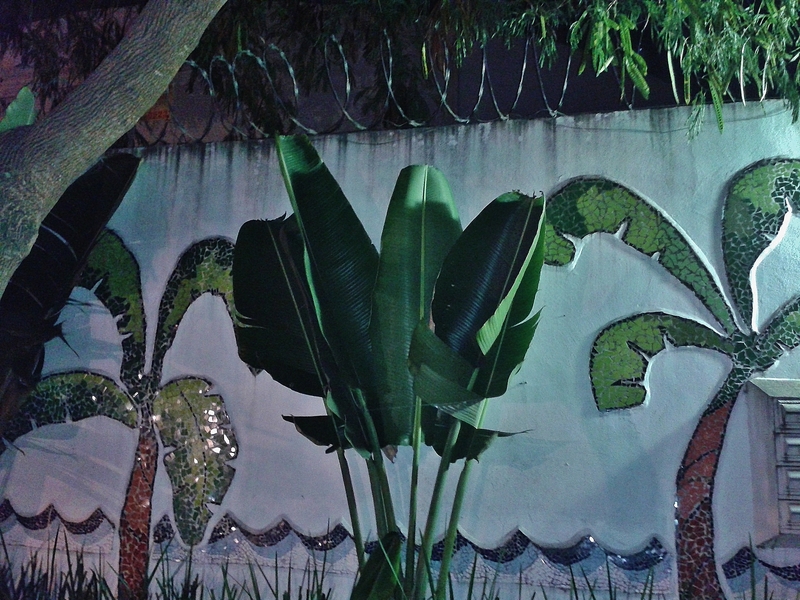 In the background, painted plant-like filigree adorns the walls of a corner sorveteria, and a beauty parlour. I stroll on. 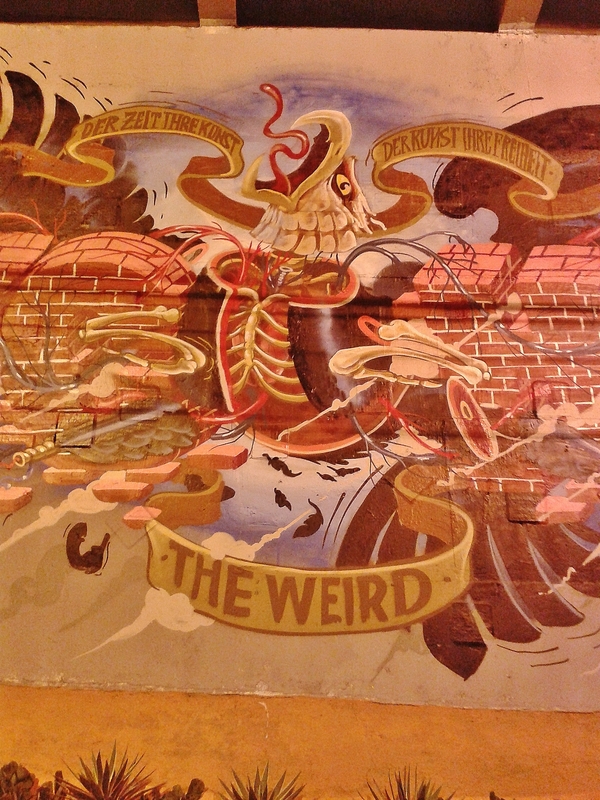 I discover an older mural. 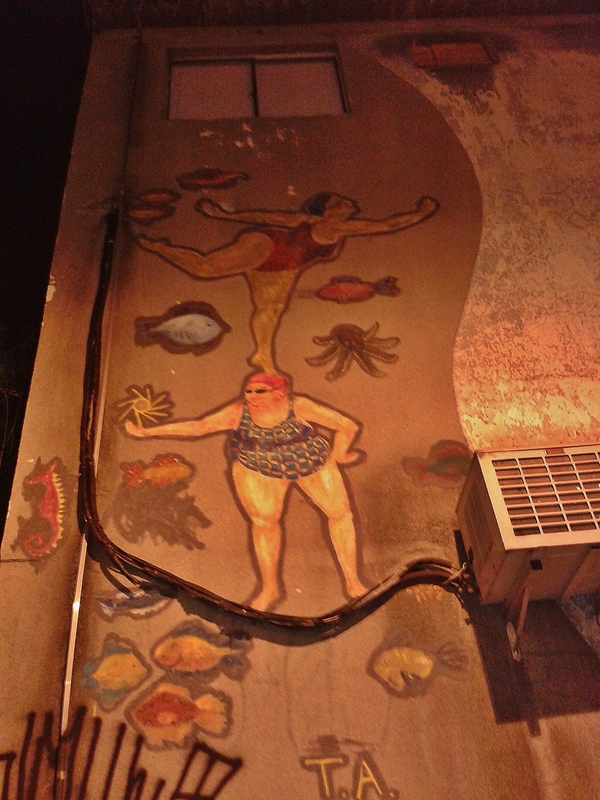 With engaging whimsy, a utilitarian wall has become a grey sandy beach – foaming water, sea creatures, bathing belles. They are from an earlier time, in subject and in style, like British seaside postcards. Rua Teodoro, usually burdened with grinding diesel buses, is calm. From the elevated walkway, something I hadn’t noticed before. 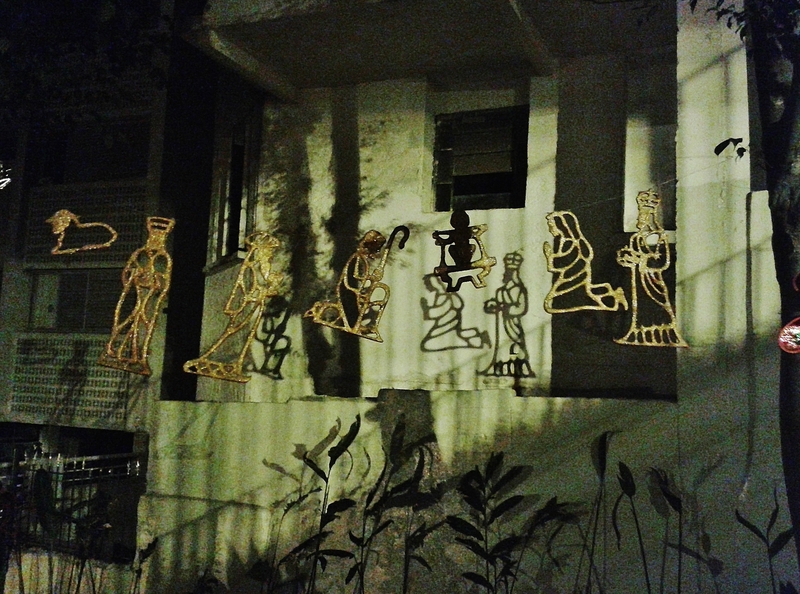 An ordinary mixed-use building shows a mythic scene. A comfortably plump figure floats free – is he underwater? In the circus ring? A long shape, a doorway, is suspended on his silver spear before a geisha, painted in flat Japanese woodcut style, while a costumed aerialist descends with a basket – an air vent – on her arm. Is it a box for steamed dumplings? Will she take what they offer? 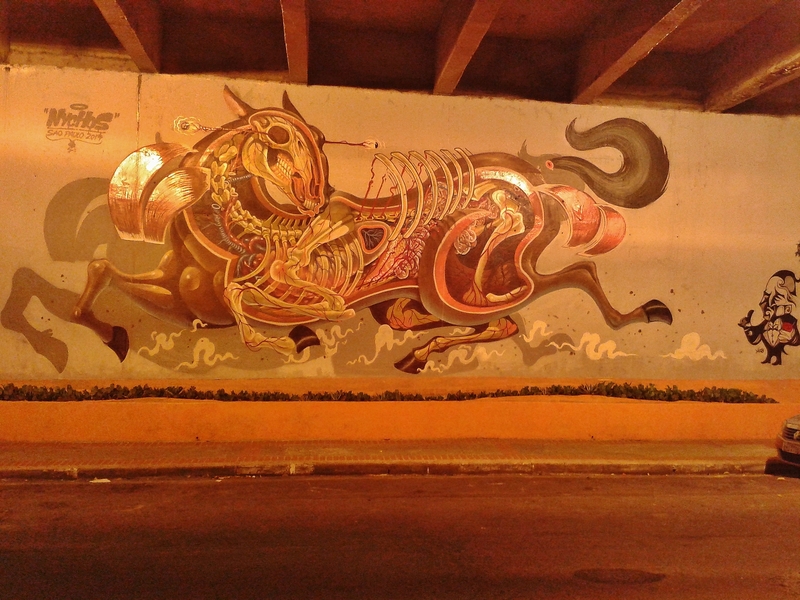 And under the walkway, on Rua Joaquim Antunes, a pair of new works strikingly lit by yellowish flood lamps. They are a horse and an eagle, in cutaway views, by Austrian muralist Nychos. The eagle is centred on a motto in his native German. “der Zeit ihre Kunst.der Kunst ihre Freiheit!” (“the time its art. 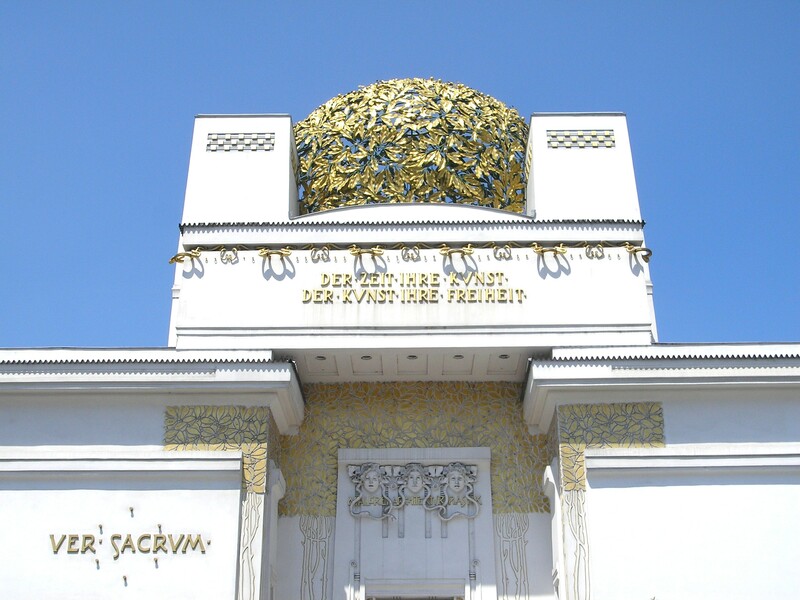 the art its freedom”) A very famous and important term which was written of top of the Secession in Vienna long time ago. 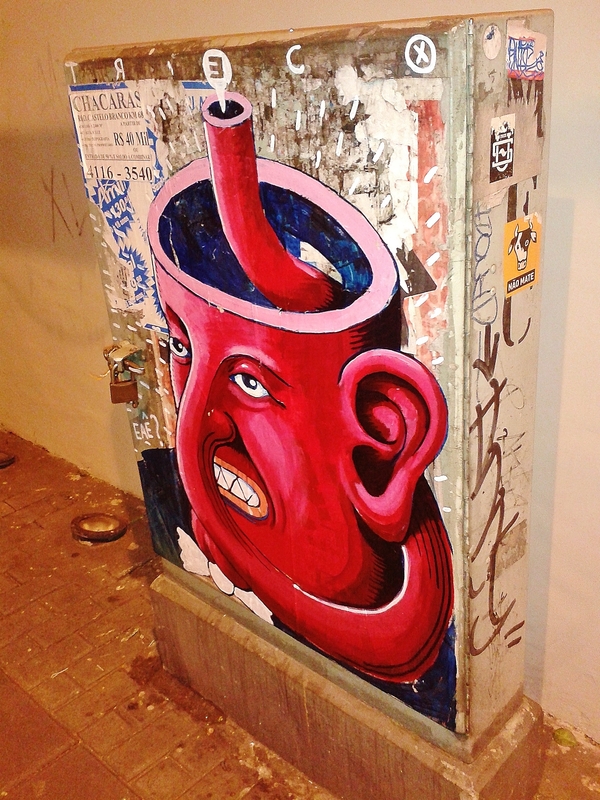 A term which has been forgotten in many ways if i watch austrian news lately.” Nychos. 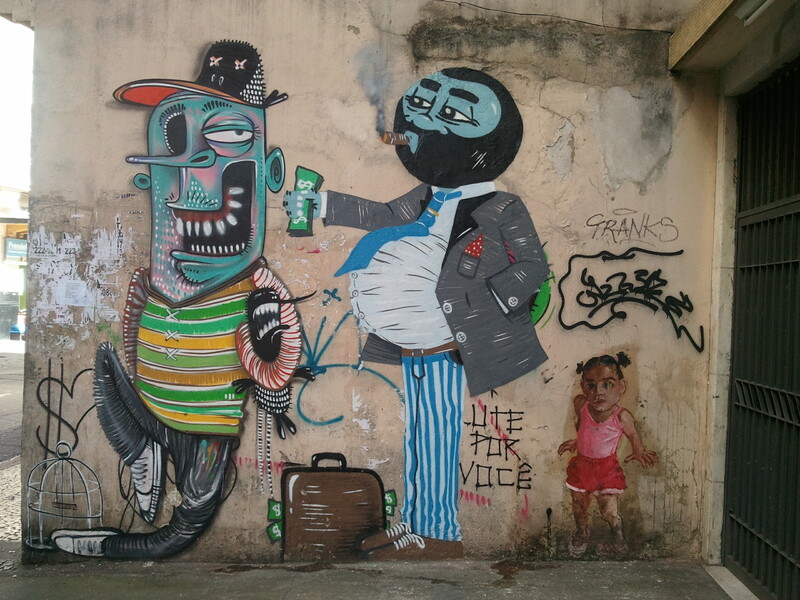 “I painted this piece in Sao Paulo to represent my 15 year anniversary of painting graffiti. 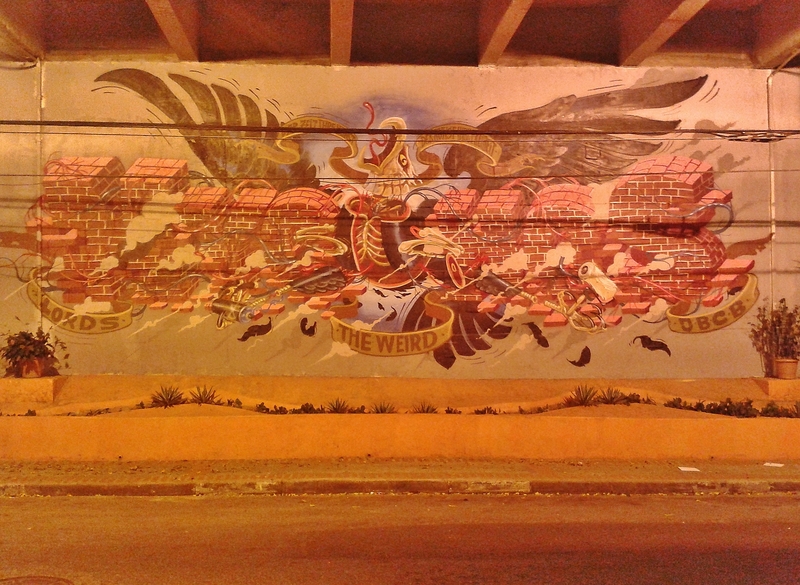 The eagle is sliced but set free, tied by his veins to the bricks with all his passion for graffiti. after all these years going through all the steps of graffiti and art, i am happy to be here where i am now, doing what i love to do most and will keep doing forever. 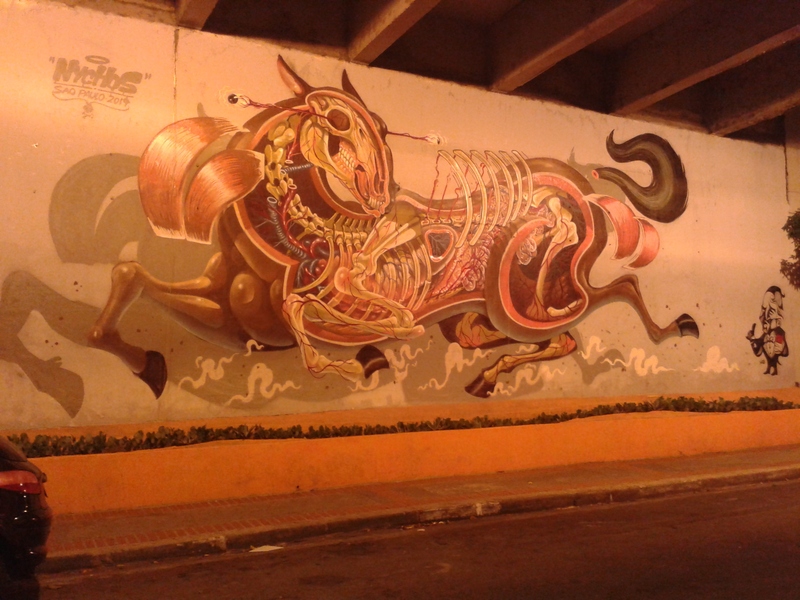 thanks to instagrafite for getting this up in the heart of brazil.” Nychos. the plastinated bodies of Gunther von Hagens, or the work of Frederick Stubbs with horse carcasses in preparation for his paintings. A graphic has been added, commenting in a cryptically good-natured way on the gringo‘s work. 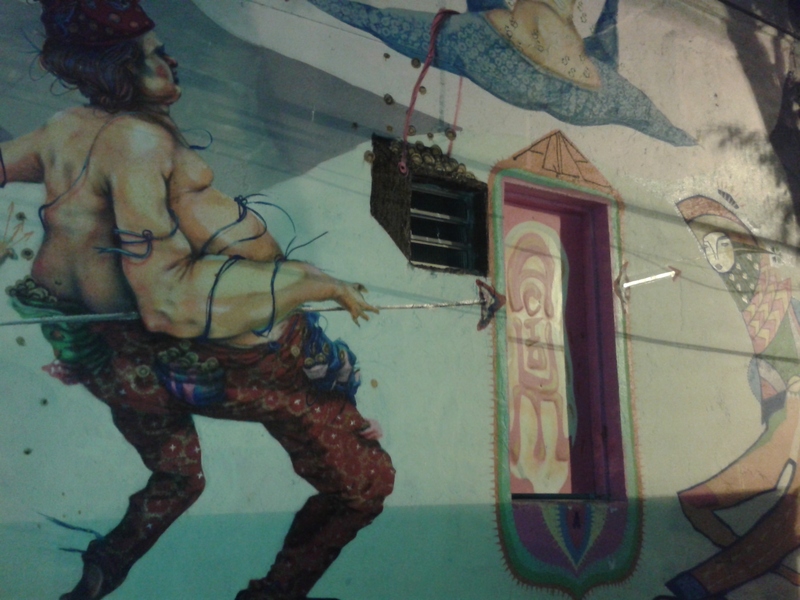 is reason enough for Brazil to be generous with its street artists, and for them to ask for and to expect support.